Riding with buses is no fun. Until Chicago does a better job of segregating bicycle and bus traffic, like some other North American cities have, cyclists will just have to deal with it. Even experienced city bikers grit their teeth when a Chicago Transit Authority bus zips passed only to swerve right in front of them to pick up/drop off passengers. More novice cyclists I’ve spoken with cite the presence of CTA buses as a major factor that keeps them from riding more. The three buses presented a dangerous situation for bicyclists in the area, as well as for the people seeking to board the second bus. The first bus driver did nothing wrong. The driver activated his or her turn signal, passed the cyclists at a sufficient distance then pulled fully into the bus stop well ahead of the cyclists. However, that bus’s presence at the stop, plus the second bus driver’s conduct created a dangerous situation. The second driver boxed the cyclists in then opened the bus door inviting riders into the path of the bikers. 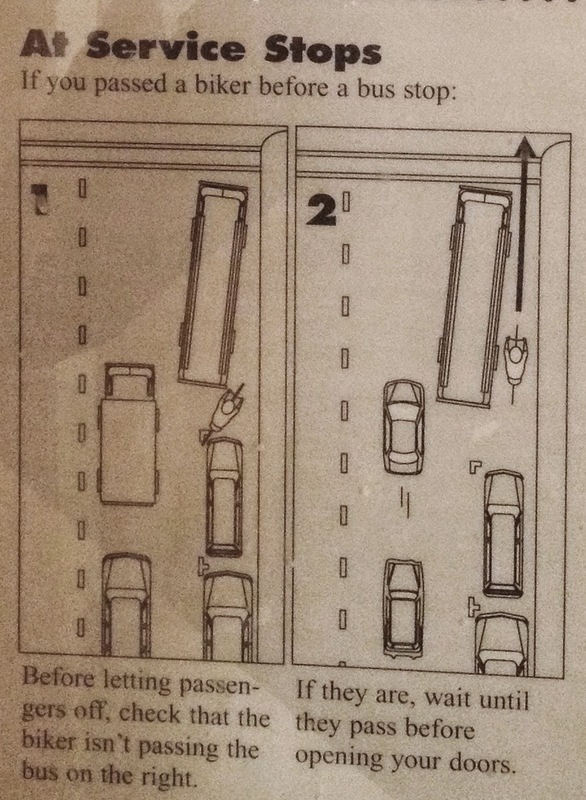 Let’s look at the CTA’s own rules regarding how drivers are to deal with bicyclists upon approaching a stop. 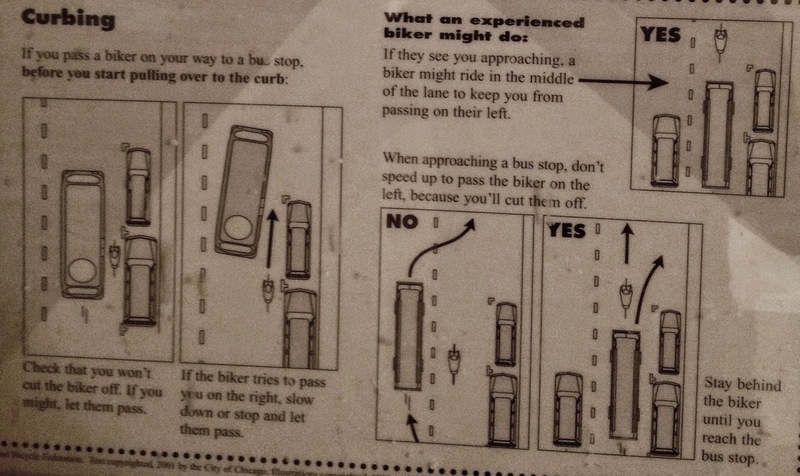 The above poster was published by the CTA in 2004 and was meant as a guide for drivers regarding safe interaction with bicyclists on the road. Comparing the sections on Service Stops and Curbing to the conduct of bus #2 in the video we see a couple of violations. Firstly, the driver should have let the two cyclists to the right of the bus pass the bus stop before bringing the vehicle to a halt. Secondly, he or she should not have opened the bus doors before allowing the cyclists to pass. Thirdly, after allowing the cyclists to pass, the driver should have pulled to the curb to discourage cyclists from passing on the right while picking up/dropping off passengers. Thankfully, the bicyclists were traveling slow enough so as not to cause injury to themselves or the people attempting to board the bus. The video shows a third bus adding additional danger to the mix. With two buses at the bus stop and now a third bicyclist passing them on the left, the third driver decided to pass the buses and all three cyclists on the left rather than wait for the bus and bicycle congestion to clear. Very foolish. Yet this sort of mess is all too common in my experience as a daily cyclist. Buses passing too close and too fast, zipping into and out of bike lanes without concern for the presence of cyclists is consistently frustrating and down right frightening. City bus drivers are required to obey the same rules of the road as are other drivers. When they fail to do so, and/or violate the procedures put in place by their employers, i.e. CTA, and their conduct causes harm, they may be held liable for so doing. 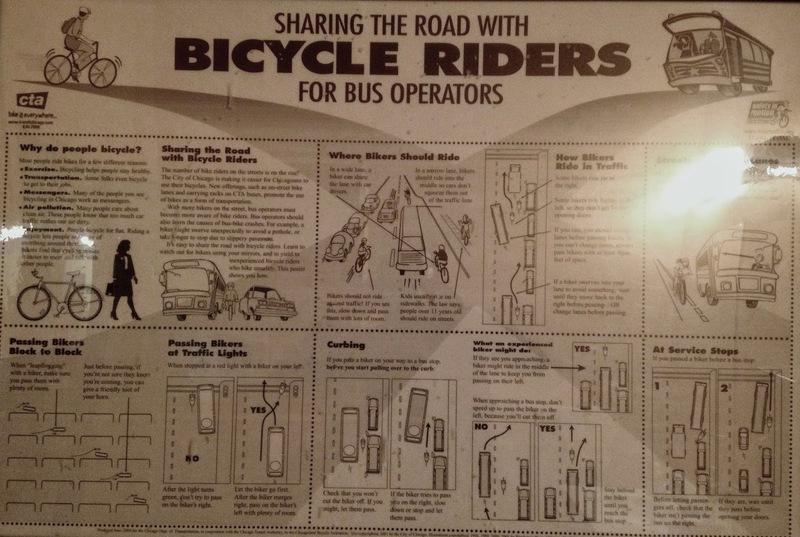 It should go without saying that bicyclists also have a duty to follow the rules of the road, the same rules applicable to drivers, and should appreciate that buses make frequent stops. Extra caution should be taken around buses. While there are some lousy bus drivers out there, I do not mean to disparage them all. Bus drivers are doing a job and generally try to and want to do so safely then go home to their families. Much blame for dangerous interactions between Chicago cyclists and bus drivers must go to the state of our current infrastructure which too often requires them to share the road with each other. That, plus the fact that the drivers are trying to maintain a strict time schedule sometimes leads to calamity. Earlier this year I had the opportunity to use bike share in San Francisco. I was impressed with that city’s efforts to segregate bus and bicycle traffic by creating bus stop islands to the left of bike lanes. With these buses need never enter bike lanes to pick up and drop off passengers. Chicago would be wise to take note.